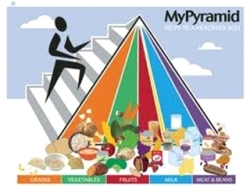 I swear we were introduced to the food pyramid when I was in grade school but a little web searching gives me just a couple – the one from 1992 and the new and improved one in 2005. The 1992 edition is shown below. If you can’t read it, good. The 2005 vertical colorful edition with the stickman and skewers for hands and feet follows. 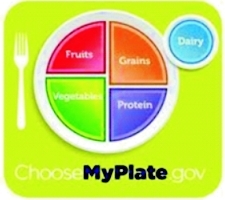 For 2011, the USDA has switched to this brilliant “plate” that looks like a pie chart developed by a group of kindergarteners employed by Microsoft, except I really don’t think anyone would want their brand tied to this thing. The purpose of these things is supposed to improve the health of Americans. In 1992 the obesity rate in the US was nearly all below 14% for every state in the union. Only six states had higher rates, Wisconsin being one of them – fried cheese curds and bratwurst. Due to its success in 2005, they rolled out an improved version. By this time only four states were as good as Wisconsin was bad thirteen years prior. Let me try a different angle on that. By 2005, all but four states had MORE than 20% obesity. We improved from only six states with more than 14% to all BUT four states ABOVE 20%. By 2009, the last year for which data are available, only Colorado is below 20%. Thirty-four states are over 25% and nine of those are over 30%. It appears that since these brilliant tools rolled out that obesity rates increased from 10-15% to 25-30%. Progress. A picture is worth 742 words. 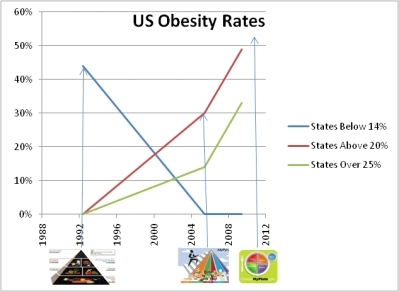 Data are depicted in the nearby US Obesity Rates chart. This is the brainchild of the USDA, the same organization that floods schools with subsidized fat-bomb food. Meanwhile, there wages a war against soda and salty snack foods companies but the real culprit is the USDA that peddles this crap. Surprise! Despite being bombarded with data, having nutrition labeling on everything, including in some jurisdictions (NYC) on menu items served by mom and pop restaurants, the trend continues. Why? Americans on average don’t give a hoot or maybe they just don’t want to change; don’t want to give up anything. Give me pills, sugar free this and that, fat free this and that, none of which work. For most people, the solution is simple. Eat less and lower fat and sugar filled crap. And get more exercise. 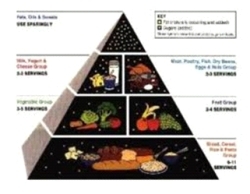 What good is a cartoon chart or for that matter, more nutrition information? And so it will be with energy efficiency. The smart grid and smart meters are anticipated to be the second coming of Jimmy Carter for energy efficiency. There’s a problem with this mentality. People have to give a hoot. We can bombard people with information at every turn but one has to give a hoot to save energy. EVERYTHING else can have snapback and erosion of savings over time, if not immediately. Efficient lights use no energy so leave them on all the time. I have an efficient furnace now so I’m going to maintain a New Delhi climate in my house. I have trouble keeping it cool in this building so I’m going to turn the chiller down to 40F and not bother to change it back. Never mind that chilled water temperature may not even be the problem. At Michaels’ La Crosse office, we have about three acres of west facing glass that unfortunately does not have good thermal characteristics. Anybody who knows anything about EE knows solar loads on cooling systems are huge. Yet our high quality three acre’s worth of roller blinds are only about 30% deployed on average as the solar energy pounds away. I’ll report back to see if this shaming worked. If not, I’ll list the names of everyone sitting closest to unprotected windows. I’ll see if threats work! No. I take it back. I want to isolate the shame effects from the threat effects. I’ll report on the shame effects in a month and if that doesn’t result in 100% compliance, I’ll do the threat test the following month. Here is a really twisted perversion of energy efficiency: some technologies often result in more energy consumption, consistently. Consider occupancy sensors for automatic lighting controls. The first thing I did on my computer when we moved into our offices downtown was go to wattstopper.com to find information for the sensor on my wall to see how I could neuter it, and I did so immediately. I set it to be manually switched on and auto off. My overhead lights are used about 20 minutes per year – sometimes in the winter when I’m gathering up my stuff to go home, and sometimes for meetings with old bats who can’t see. Otherwise the high pressure sodium streetlight outside is plenty. I’m hard wired to shut stuff off when I’m not around or using stuff. However, I’ve been trained by our occupancy sensors in other rooms to leave stuff on. We even have a sticker on one switch that says Leave the Lights On! More progress! I would just as soon fix these with a 34 inch Louisville Slugger. Occupancy sensors are clearly meant for users who don’t give a hoot. On top of all this, occupancy sensors punish hard work. I was told years ago that if you sit absolutely still for the delay period (adjustable from maybe a minute to a half hour), the lights may go out. Bull. You have to do a fourth quarter Bucky jump around to keep the lights on. It isn’t easy working while jumping around. In case you haven’t attended a Wisconsin Badger football game, be sure to check it out. Programmable thermostats are probably the worst thing that ever happened for energy savings. We’ve inspected hundreds of these things for program evaluations. They don’t save energy because in order to save energy you have to give a hoot. If you give a hoot, a programmable thermostat is a nuisance. A classic example included a recent verification of an installed programmable stat in a church. Prior to the installation, they turned their manual stat back for all but a handful of hours needed for occupancy each week. Post implementation, the heat is on 8-5 every day of the week. The program implementer should be fined but even so, what was wrong with the manual stat in this case? And if you’re sitting there, thinking, “I have a programmable thermostat and it is programmed according to my actual schedule, saving energy.” Really? Obviously you give a hoot. Go home and replace it with a manual one and save more. BTW, people who don’t give a hoot just put these in manual override all the time. So unlike occupancy sensors, they provide no benefit whatsoever to anyone. Our industry has an awful lot to do. This is another reason I am not in favor of in-your-face mandates. We’ve got to sell people on energy efficiency, or else their obstinance will undo the good deed. People have to give a hoot and behave!